With two young children who love to play outside and a husband who works outside all year long - no matter what the weather conditions, laundry is a household chore that never seems to end. Did you know that the average family does around 400 loads of laundry each year? Getting your clothes clean is time consuming and usually ends up at the bottom of a long list of household chores. Doing laundry doesn’t have to be at the bottom of your list any longer. With products like Tide and Maytag, and a functional, well-designed space, you can get clothes clean in one wash and have more time to spend with your family and friends. 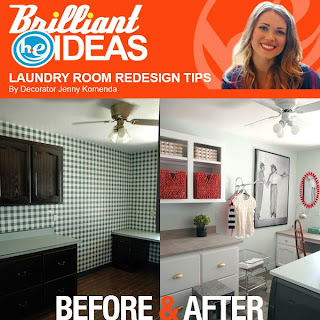 Jenny Komenda, decorator and blogger at The Little Green Notebook shares great tips on how to create a more efficient space in your laundry room. Dealing with a dark, cave-like laundry room is a chore in and of itself! By taking off the doors on a few of your upper cabinets, you'll open up the space and create a place to store baskets. In this laundry room, we assigned baskets for every member of the house, which makes sorting a breeze! Why not decoupage or paint insides of cabinets for a fun pop of color? It's a guaranteed smile each and every time you reach for your detergent. Don't like the cabinets, floors and countertops in your laundry room? Every surface can be painted or resurfaced! For less than $30 in materials, the outdated linoleum, brick pavers and old, dark cabinets were updated in this laundry room with paint and with a concrete overlay product. A rolling laundry butler can be your best friend, doing triple duty with a hanging bar, a rolling basket and a drying rack. It's the perfect choice for a laundry room with limited space that hasn't been updated in a few decades. Don't neglect your laundry room walls! Hanging interesting art and mirrors will elevate your room and make it feel less utilitarian and more “homey”. Suddenly those 400 loads of laundry most of us will do this year might actually be enjoyable! Use a slab of stone or a simple piece of painted MDF on top of the washer/dryer units to create a folding station and to prevent socks from slipping in between the appliances. 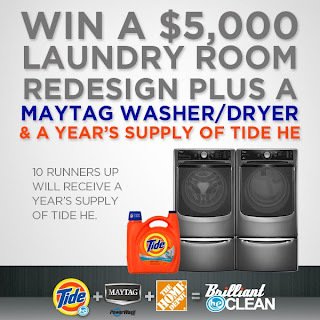 Be sure to visit www.tideandmaytag.com to enter the Brilliant Clean sweepstakes. One winner will be chosen at random to receive an e-design consultation by Jenny, a Maytag Washer and Dryer, a year’s supply of Tide and $5,000! Ten runners up will receive a year’s supply of Tide. This giveaway will end August 30th at Midnight EST. Disclaimer: I received a complimentary #BrilliantHEClean prize pack for the purpose of writing a review and hosting a giveaway. Regardless, I only recommend products or services I use personally and/or believe will be a good fit for my readers. The views and opinions expressed on this blog are purely my own. Results may vary. No monetary compensation was received. I like the tip to decorate the laundry room with interesting art and mirrors. I would like to paint my laundry room and hang a picture or two. Great tips! I especially like this one-A rolling laundry butler can be your best friend, doing triple duty with a hanging bar, a rolling basket and a drying rack. One of my laundry tips is to add Lavender oil to linens rinse cycle for fresh scent. I like this tip: By taking off the doors on a few of your upper cabinets, you'll open up the space and create a place to store baskets. I think this would help us to have more space. My favorite tip is adding decoupage or paint the insides of your cabinets for a fun pop of color. I think this definitely helps to brighten up the room and make it a little special! My favorite tip: Hanging interesting art and mirrors will elevate your room and make it feel less utilitarian and a little homier. Laundry tip: Add 3/4 cups of vinegar to your final rinse cycle and your clothes will come out soft. I like tip #1. Remove cabinet doors and adding the basket. Changed the whole look. My best tip is to have separate baskets for dark's, brights, whites, towels. It saves me time sorting. I like tip #4: A rolling laundry butler can be your best friend, doing triple duty with a hanging bar, a rolling basket and a drying rack. I think that would be very useful. My best laundry tip is to have separate baskets to separate laundry into. Whites, darks, mixed, delicates, etc. I like her idea of having one of those rolling laundry butlers; I' want to buy one. My best tip; when towel small musty add a cup of white vinegar to the rinse. A great tip is to sort out your laundry by color (whites, brights, etc) before tackling the laundry to save time. Stay on top of it every day - a little every day saves you from getting piled up and overwhelmed! Makes a big difference. This is my favorite tip there Why not decoupage or paint the insides of your cabinets for a fun pop of color? I think it would be really cute and you could coordinate with your wall color. My best laundry tip is treat stains right away, it's an old tip, but it's effective. I like tip 4- A rolling laundry butler can be your best friend, doing triple duty with a hanging bar, a rolling basket and a drying rack. Don't neglect your laundry room walls! My walls have a few things on them and you need interest when doing laundry in my opinion. My favorite is tip #1 : By taking off the doors on a few of your upper cabinets, you'll open up the space and create a place to store baskets. My favorite laundry tip is: "A rolling laundry butler can be your best friend, doing triple duty with a hanging bar, a rolling basket and a drying rack." My favorite tip is adding a rolling laundry butler in your laundry room area. This is exactly what I need because I have very limited space! My best tip is to do your laundry on a regular basis and not let it pile up and get out of control. Also, have your kids or grandchildren help with simple tasks like matching like socks. My laundry room is so small that most of the tips provided do not apply, but I love tip #4 the rolling laundry butler to help keep things organized and allow me to put things away with less trips back and forth. My favorite tip is about using a rolling laundry butler. I do so much laundry and I appreciate the tips! My favorite tip is Don't neglect your laundry room walls! Hanging interesting art and mirrors will elevate your room and make it feel less utilitarian and a little homier. My favorite tip was to paint or decoupage the insides of the cabinets to add a little pop of color and also the idea to adhere cork boards inside the doors... such fun and functional ideas! My laundry tip is to always make sure to separate like colors so they don’t bleed into one another and turn clothing inside out! 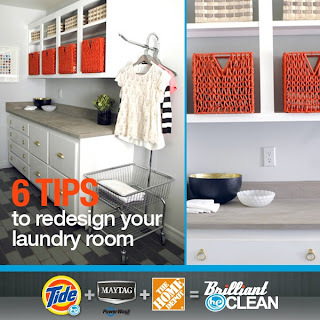 I like the tip: Don't neglect your laundry room walls! Hanging interesting art and mirrors will elevate your room and make it feel less utilitarian and a little homier. The idea about the rolling laundry butler is genius! My husband hangs the majority of his clothes and I typically drape them over a chair or lay on the bed. I love this idea. My favorite tip is: A rolling laundry butler can be your best friend, doing triple duty with a hanging bar, a rolling basket and a drying rack. What a great idea! I like tip #4. I think it would be great to have a rolling laundry butler. It would really come in hand in my laundry room. My best tip is to have two different hampers or baskets in the laundry room. One for whites and the other for colors. It's made my work a little easier since I started doing it. I love the idea of instead of resurfacing a call or cabinet area that you do not like- add a little paint! It's way cheaper and much simpler. We recently did that to our brown panneled walls in our home and it made the home look much newer and more modern! I like the idea of having a folding station. Unfortunately, our laundry room is really just a utility closet, so there's no room for folding anything, but one day I'd love to have the space to do that! I actually try to anticipate what color loads I'll be doing soon, and I choose certain things like towels or sheets accordingly. That way I know I'll have a whole load of reds and oranges, for example. I like the tip don't neglect the laundry room walls. Many time the paint is chipped or bad and it looks drab! My best tip is not to clutter. Sometimes we make the laundry room a a storage room! Keep it neat and simple! #4 is my favorite: "A rolling laundry butler can be your best friend, doing triple duty with a hanging bar, a rolling basket and a drying rack"
My best laundry tip is to have a place to sort laundry as it is soiled. Then on laundry day it doesn't have to be done, or if you only have time to grab and toss one load it is all ready to go. My favorite: A rolling laundry butler can be your best friend, doing triple duty with a hanging bar, a rolling basket and a drying rack. It's the perfect choice for smaller laundry rooms that haven’t been updated in a few decades. My Favorite tip-A rolling laundry butler can be your best friend. I love the tip of the rolling laundry butler that can be your best friend, doing triple duty with a hanging bar, a rolling basket and a drying rack. My small laundry room could really use this. Because mine? Are super neglected. Except for the smudges I managed to get on them, somehow. My favorite laundry tip is, make a paste with baking soda and water apply to stain asap helps it from setting in and lifts it away! My favorite tip is using baking soda and water to help keep stains from setting in to clothes. I always seem to run out of Shoot in the most inconvinient times so this will be perfect for those times. Love the idea of taking off the cabinet doors to make it seem more open and using baskets to hide things. Looks so clean and fresh. My favorite is the folding station. Maybe clothes would be put away faster! I really like the "color pop" and corkboard tip for the insides of cabinets and doors. I liked the tip #6 because I always, always loose socks. Two pair went in the washer and dryer, but only one sock is found when folding laundry!! Oh my favorite tip is: Don't neglect your laundry room walls! Hanging interesting art and mirrors will elevate your room and make it feel less utilitarian and a little homier. Suddenly those 400 loads of laundry most of us will do this year might actually be enjoyable! Oh my walls really need help! My laundry room is in the basement with the cement blocks for walls! I would LOVE to paint them and decorate some! We dont get alot of light...so its pretty dreary down there! My favorite tip is #6: A folding station makes all the difference. Use a slab of stone or a simple piece of painted MDF on top of washer/dryer units to create a folding station that also prevent socks from slipping in between the appliances! tip: presoak any pit stains in dawn and vinegar.. gets them out no problem. I had never even heard of a laundry butler before - what a great idea!!! I think I need one now! I love to win this for my parents who just got married because they love shopping at Home Depot and Ace. my favorite is don't neglect the walls. My laundry room is also my pantry, so I cannot do much in there. I like the idea of hanging interesting art and mirrors. Her clothespin mirror was cute. I need something down in my laundry room! I like tip 4. A rolling laundry butler can be your best friend, doing triple duty with a hanging bar, a rolling basket and a drying rack. I could definitely use one. I love the idea of painting the inside of your cabinets for a pop of color. Anything to make doing laundry a little more cheery! This is my favorite tip: A rolling laundry butler can be your best friend, doing triple duty with a hanging bar, a rolling basket and a drying rack. My favorite tip is -A folding station makes all the difference. Use a slab of stone or a simple piece of painted MDF on top of washer/dryer units to create a folding station that also prevent socks from slipping in between the appliances! I like the tip about making sure that your laundry room walls are looking good - that the paint isn't chipping also a nice fresh paint color as well. My laundry is in the garage but I can still incorporate the idea of making the area around it look nice. I like the idea of using a rolling laundry butler and putting pictures up on the walls of my laundry room. A folding station makes all the difference is my favorite tip - I actually need a space for this - I never can fold the laundry well - hubby hates the way i fold his shirts lol. my best tip - I like to use the pods laundry detergent for full loads - much easier - no measuring - also I have a portable hanging system that comes apart for storage that I hang shirts up on. I like tip #1 about removing the doors to the cabinets to open up the room. I could do this in my laundry room to make it look bigger. Tip 5- Don't neglect the laundry room walls!!! My laundry room needs to be finished...I don't like doing laundry at all and I think finishing the room would help me since I have a hard time keeping up with it already!! My tip: Keep up with the laundry. Don't let it go so you have tons to do! Also, I love adding some essential oils to my homemade laundry detergent to make it smell wonderful! Taking the doors off the cabinets- I did that and it has made everything smoother! My tip - even after a grease stain has been washed and dried, if you use Spray n Wash, soak it and let it sit for 5 minutes, it will almost certainly come out. Also - use a vinegar rinse on your towels, it will keep them smelling fresh and cut down on soap. My favorite is tip #6. My least favorite part of doing laundry is the folding so a folding station would definitely come in handy for me! I live in a house with my husband and 3 teenage boys. The laundry room is the only room in the house I can decorate with bright fun colors and prints. Tip # 5 is my favorite. Don't forget about the walls! My roommates and I really need something like this so we can fix up our room! A rolling laundry butler can be your best friend, doing triple duty with a hanging bar, a rolling basket and a drying rack. I want one of these. my laundry tip is one i saw on pinterest. you can turn an ordinary wire shelf upside down so it tilts and stack your baskets on top of it so no more bending down. i like the tip where you open up space by removing cabinets for storage for your baskets. I like the tip regarding the rolling laundry butler, it is such a versatile piece in the laundry room that it can indeed be used a variety of ways which is important. I would love to have one myself! I like tip #4 about having a rolling laundry butler in the laundry room. This would be so nice to have and make it so much easier hanging up clothes right out of the dryer rather than dragging them into the house in the basket and then hanging them up and it would help eliminate the wrinkles too. Painting the insides of the cabinets! I love that idea. I am going to mention it to my fiancée and see what he thinks! My best laundry tip is to bring light baskets down so you can load and unload your laundry really easy. My favorite tip from the ones posted is to paint the inside of the cabinets with a bright pop of color. it certainly does cheer up my laundry room. My personal favorite laundry tip is not to let the laundry pile up. I do a load every day or so and it does not seem to overwhelm me that way. No laundry room. I have to walk 5 blocks to the laundrymat. But I hate to have the laundry pile up. Makes it even tougher to do. Why not decoupage or paint the insides of your cabinets for a fun pop of color? It's a guaranteed smile each and every time you reach for your detergent. Also don't ignore the door. Adhere some cork panels on the inside of the cabinet doors and create a space to pin all those stain removal tips. Tell me in a comment your best laundry tip! my favorite tip is about hanging interesting art and mirrors on your walls--so simple! my tip comes from martha stewart. fold your fitted and flat sheets inside the matching pillowcase. that way, you're not hunting around for the matching sets! My best laundry tip is to separate things out. I do whites, darks, and brights.